The ACOG and their OBGYN members know that when tubal ligation surgeries and ESSURE sterilizations are performed that many of the women will be returning for second and third surgeries such as ablations, D&C’s (dilation and curettage) and hysterectomies because of side effects from the sterilization. The very same organization/obgyn doctors that withheld the information and profited by doing so then go on to profit again from the original consumer fraud. Women are not informed at the time of their sterilization that the surgery or essure device could create such conditions that would necessitate such treatments. Women are told at the time of these second and third surgical procedures that their sterilization had in no way caused their health condition that necessitated such radical procedures. This creates a cycle of abuse. which adds another dimension to the cycle of abuse. 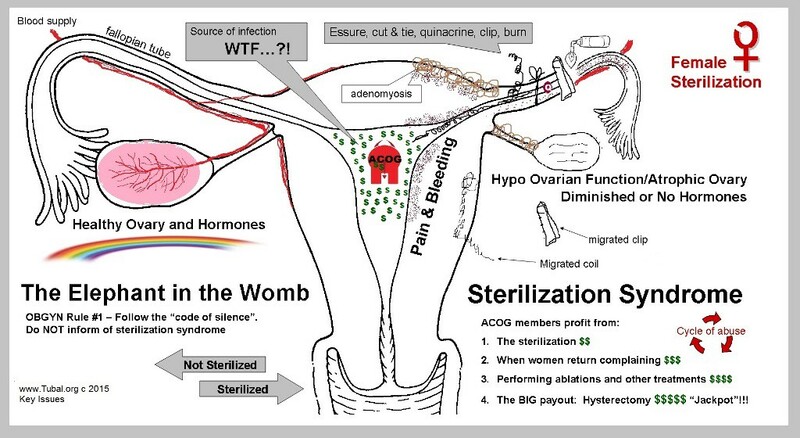 ACOG/OBGYN Promotes/Suggests/Sells Sterilization — The ACOG and OBGYNs withholds information regarding negative side effects to sterilization which could cause loss of hormones (ovarian isolation), adenomyosis (that manifests as dysfunctional uterine bleeding), hydrosalpinx (hydrosalpinges), and chronic pelvic pain. Women are often sold sterilization by being told that they will no longer need to take the “pill”, will no longer need to remember to take the pill, and sometimes are told that it’s unsafe for them to get pregnant again or unsafe for them to be taking the pill. 4. Woman experiences Post Sterilization Syndrome (pelvic pain, dysfunctional uterine bleeding, loss of hormones [which manifests as loss of libido, vaginal dryness, fatigue, etc…]) With negative changes in health, woman returns to her OBGYN doctor. 5. ACOG/OBGYN again withholds information. The woman is told that “her sterilization had no bearing on her current condition or symptoms”. OBGYNs hold fast to this statement and this is inline with the ACOG “code of silence” regarding sterilization. To state anything other then this would be breaking the code and would be major cause for retaliation by the ACOG and other OBGYN peers (including taking action to strip that person of their medical license). Doctors who make these false statements do so in order to protect themselves (and their peers) as they know that the woman was not informed at the time of her sterilization by themselves directly or by one of their peers. If the woman asks if her condition could be hormone related (or asks for testing) she is usually told that she’s too young to be in menopause and is refused hormone testing. Sterilized women are often told that hormone testing is not necessary, is unreliable, very expensive, and insurance will not pay for it (all which is not true). If the woman is suffering loss of ovarian function (loss of hormones), not hormone testing, diagnosing, or treating can cause the woman to suffer longer and to have her condition progress, deteriorate, and worsen… this is another battery and a form of physical imprisonment. Many (most) post sterilized women suffering post sterilization syndrome are put on the pill (without 1st hormone testing) which could also be construed as a battery as the doctor is giving the pill to treat a condition which is not diagnosed (without hormone testing it’s not known if hormones are even needed). If hormones are needed, other hormone treatments are more appropriate and safer then the pill. The ACOG and OBGYNs know this. 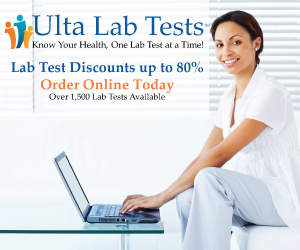 The pill is designed for young women with normal hormone production (and normal hormone levels) to prevent pregnancy…. not as hormone replacement therapy (HRT) for a woman depleted of hormones. Taking the pill puts all women at risk of stroking out. This risk increases with age, smoking, and high blood pressure. The doctor prescribes the sterilized woman the pill because the doctor knows (or suspects) her hormones are depleted. OBGYNs feel safe in prescribing the pill because they often prescribe the pill to their unsterilized patients and feel as though no one would ever “question” them why they are prescribing the pill for one of their patients. OBGYNs also feel safe in prescribing the pill to post sterilized women as they known most women who have been sterilized have been on the pill at some time of their life so it’s not completely foreign to them as would be other treatments such as hormone replacement therapy (HRT). Also, with the pill the doctor has a better excuse to give the woman as to why they need the pill. Women are told that they are being given the pill to “regulate” their menstrual bleeding (not because the doctor suspects they are in a depleted hormone state). The fact is not only can the pill be very dangerous, it may actually cause her dysfunctional uterine bleeding to worsen which can lead her more quickly in the direction to a surgical cure to her condition. Refusing to test hormone levels in a woman who has had a surgery or treatment which is known to negatively effect hormone production, and refusing to diagnosis and properly treat such a condition in order to protect oneself (or their peers) that they themselves have created this condition and didn’t forewarn the woman in advance of all the known risks is criminal and further relates to battery. 6. OBGYN suggests/performs surgical remedies to treat her current condition. The primary battery (the sterilization which lacked true informed consent) is known to create physical conditions such as adenomyosis that manifests as dysfunctional uterine bleeding (DUB), hydrosalpinx (hydrosalpinges), chronic pelvic pain which require radical surgical treatments such as D&C, ablation, NovaSure, salpingectomy (removal of both fallopian tubes), hysterectomy to remedy. The OBGYN doctor (or a peer) (and the ACOG) goes on to profit from performing these radical surgical treatments for the condition(s) that were caused by the sterilization. Women are the target of this abuse. All women need protection from this abuse. What is needed is Informed Consent Law in order to end this cycle of abuse. Harmful devices (such as Essure) need to be recalled and banned by the FDA. See below the video presentation and testimony Dr. Hufnagel gave regarding Essure to the FDA on 9/24/15. She was the ONLY MD to state the full truth… that there are CRIMES, BATTERY, and MAYHEM occurring surrounding Essure. She is the only MD to state these words and demand a full recall. Mayhem is the willful and permanent crippling, mutilation, or disfigurement of any part of the body, needless or willful damage or violence, that renders the victim defenseless. The use of Essure and tubal ligation is known to lead to hysterectomy. There is NO informed consent. 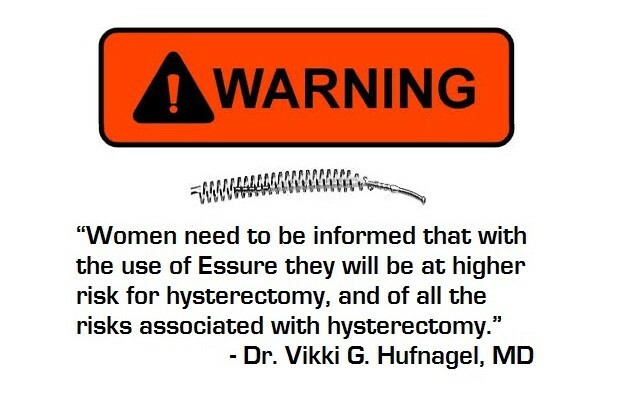 Women are NOT told that they will be at HIGHER RISK for HYSTERECTOMY with use of Essure or with tubal ligation. Three minutes is not enough time to present all the issues. The global issues are women’s health rights, sterilization and informed consent. Post Sterilized Women & the “Pill”: Did your OBGYN slip you a “Hormonal Mickey”?? ?